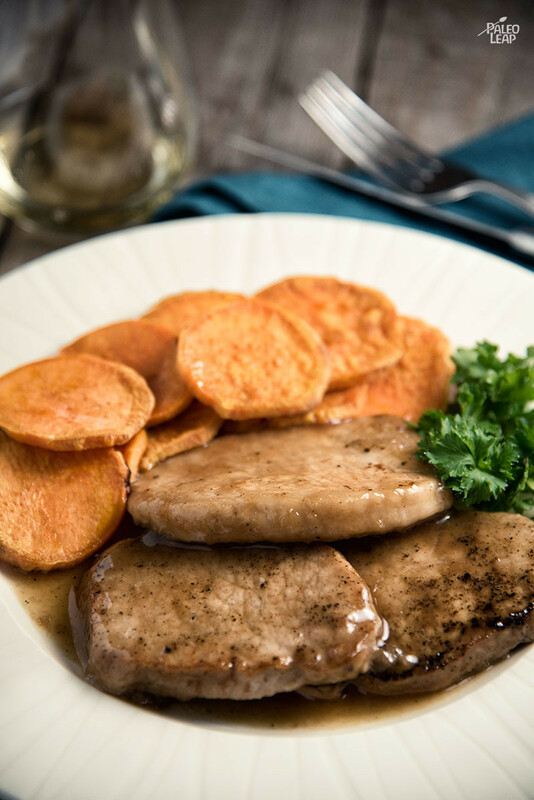 Time to add pork chops to the roster of dinners you can make in the slow-cooker! With the relatively short cooking time, this is a great option for days when you have pre-dinner errands to run. Come home, pop it in the slow-cooker, then take off for an hour or two and come home to dinner all ready and waiting. 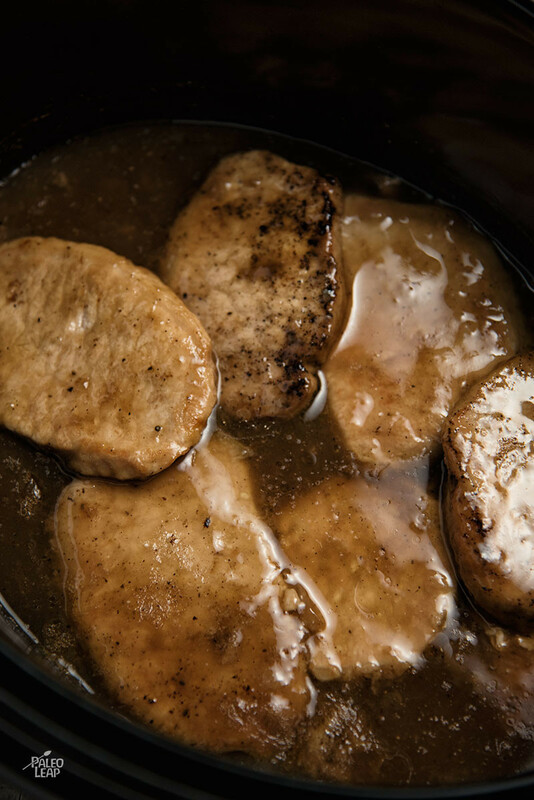 The pork chops get some flavor here from a simple beef broth thickened with a Paleo-friendly flour. Arrowroot and tapioca flour might not be terribly familiar, but both of them are perfectly Paleo – they’re made from roots, not from grains. Neither is particularly nutrient-dense, but that’s why you’re using them to thicken a sauce and not as a primary source of calories. The extra sauce here would taste pretty good dripped over a pile of mashed potatoes (yes potatoes, or substitute cauliflower or celeriac or any number of other vegetables if potatoes aren’t your style). With all that delicious beef broth in there, don’t just throw it down the sink! SERVES: 4 PREP: 15 min. COOK: 3 h.
Mix together the flour, dry mustard, garlic powder, sea salt, and black pepper. Lightly coat each pork chop in the flour mixture, reserving the remaining flour mix. Brown the pork chops 1 to 2 minutes per side, and place in the slow cooker. Mix the remaining flour mix with the beef stock, whisking until well-blended. Pour the beef stock mixture over the pork chops, and cook on high for about 2 hours.